When an active killer targets a school, the standard protocol is to wait for law enforcement to arrive on the scene to stop the violence. In 2013, that protocol started to change for many schools, with the introduction of the FASTER Saves Lives program, which provides lethal force training and medical response to teachers and staff members. Now, after five years, FASTER Saves Lives has trained 1091 school teachers and staff members from 225 districts in 12 states. This includes teachers and staff in 76 of Ohio's 88 counties. We will also provide the 'Trauma Medicine for Active Killer Events' training to another 200 staff before then end of the year. Sponsored by Buckeye Firearms Foundation, the FASTER (Faculty/Administrator Safety Training and Emergency Response) training provides school staff with the knowledge, mindset, and skills to stop an active killer and start treating the injured. FASTER started the 2017 training schedule by conducting 4 classes at 3 different facilities across 2 states all in the first 8 days of the schedule. This included our first-ever out-of-state class for school staff near Denver, Colorado. We ended this year’s Level 1 and 2 schedule with back to back-to-back to back classes over 12 days the last two weeks in July. National media from California, New York and Washington, D.C. where here in Ohio to covered this final group of classes. I wish to offer special thanks to John Benner and the staff at TDI, as well as to Chris Cerino and staff from Cerino Training Group for their expertise, enthusiasm and perseverance through a difficult schedule and weather. The school staff also maintained an excellent attitude throughout. In the past five years, FASTER Saves Lives has evolved from a one-time concept class, to a popular Ohio program, to the standard for school safety and security. We are honored and thankful for the opportunity to partner with John Benner, who we believe to be the most knowledgeable person on the topic of stopping active killers in the country. Mr. Benner has long been a leader in law enforcement response, often by decades. Time will prove he’s done the same with school response to violence. When we started, it never occurred to me that it would continue beyond the first class. Even in the second year, we were still training “gun people,” most of which were still in the process of begging their boards of education for permission to carry firearms. Today, participants are selected by schools administrations, who ask us to train key people. Law enforcement has become an important partner. Many school resource officers (SRO’s) have taken the training along with their district school staff. They take the lessons back to their local department and serve as a liaison between the school and law enforcement. Police regularly re-qualify the school staff and provide continuing training opportunities. Schools are allowing police to train in the school buildings. School staff who do not want to carry a gun are learning how to treat trauma injuries and schools are investing in trauma equipment. There have been several instances where the medial training and equipment has saved lives, and others where school staff’s possession of firearms undeniably made their school and children safer during critical events. One superintendent helped his sheriff identify a suspect in a double murder. Many ingenious safety/security improvements have been made before events happen because school staff have a proactive mindset. 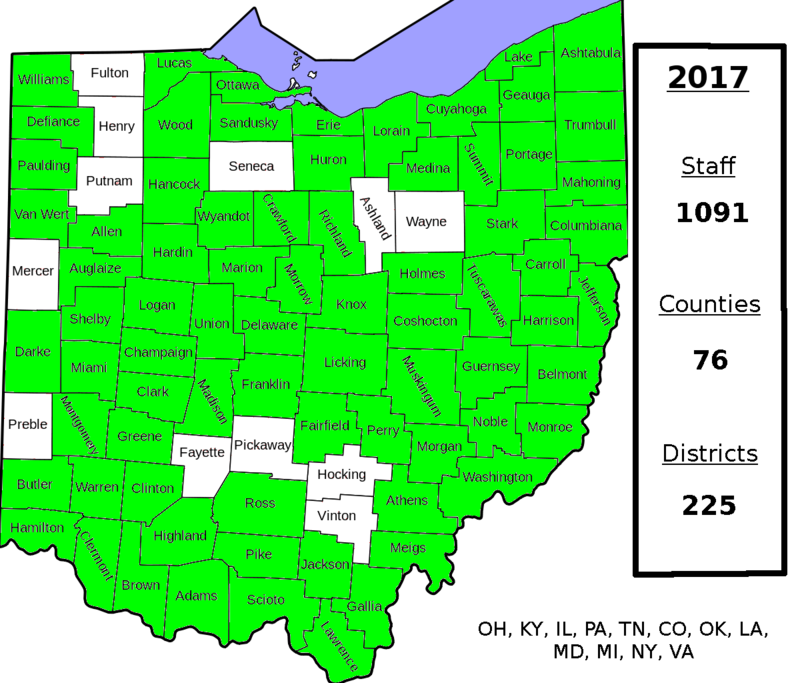 Ohio has model language (ORC 2923.122 (D)(1)(a)) which gives schools local control on who carries guns and how much training they are required to complete to continue carrying. Over the past several years several states have moved to allow schools to designate people, but too often burdensome restrictions have prevented real progress. Ohio also leads the nation in funding this important program. The current biennium budget designates a small amount of money for the FASTER Saves Lives training and the purchase of trauma equipment (tourniquets, compression bandages, chest seals, etc.) for schools that train their staff in their use. While all four Republican gubernatorial candidates were invited to attend some of this year’s training, only Secretary of State Jon Husted took time to attend. Husted attended a TDI class and visited with trainers and school staff. Buckeye Firearms Foundation has donated nearly $1,000,000.00 and several individuals have donated thousands of hours to make this program a success. The state recognition and funding is necessary for continued success. It has been an honor to work with our nation’s experts on violence and medical care and help facilitate the transfer of their knowledge to school staff and local law enforcement. Five years ago I would not have believed it was possible to accomplish what I have witnessed through the FASTER Saves Lives program. I’m excited for what the next five years will bring to the world of education. Jim Irvine is the Buckeye Firearms Foundation President, BFA PAC Chairman and recipient of the NRA-ILA's 2011 "Jay M. Littlefield Volunteer of the Year Award" and the CCRKBA's 2012 "Gun Rights Defender of the Year Award."